Alternative Armies: Sengoku 15mm Japanese Fantasy fourth wave singles and packs released! Sengoku 15mm Japanese Fantasy fourth wave singles and packs released! Wave Four is now released! The Sengoku range of 15mm scale Japanese Fantasy sculpted by John Bell is the largest such range in the world. 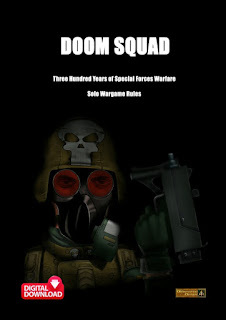 It now has eighty plus single codes and packs as well as four complete wave sets and two HOTT 2nd Edition 24AP Armies supplied with all needed element bases. 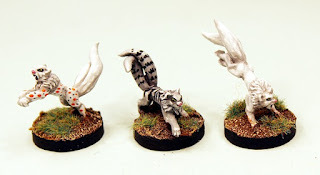 Great for Japan themed games or spicing up your 15mm fantasy or pulp or post-apocalyptic collections among many others. As well as Male and Female warriors there are Male and Female Buddhist monks. There are Goblins and Kappa was well as Tengu and Oni. Sengoku has Ghosts, Snakes and Monsters plus centipede, snake and spider bodied warriors and monsters. School Girls in Japanese uniforms, Goblin Cavalry, Plant Sprits and Ghosts. Now many Tanuki as well as Baku, Nekomata, Inugami, Nurikabe and Demons. 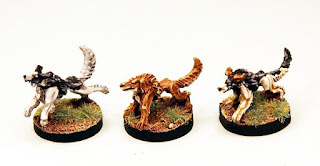 Go HERE for the range page where all the miniatures are. We are proud to announce the release of the forth wave of Sengoku miniatures. Here is a list of the new codes, singles, packs and set. Go HERE. 22 white metal and resin miniatures designed by John Bell suitable for use in any oriental themed 15mm scale game system or army. This is a set containing one of every pose in the forth set of the range SGF60 through to SGF81. Small amount of Assembly required. The pack offers a small saving off single purchases of those codes. Get one of everything! 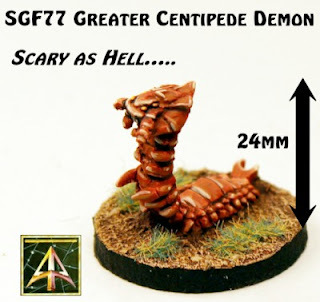 This pack contains three large 15mm miniatures taken from SGF60, SGF61 and SGF62. The pack offers a small saving off single purchase of these codes. This pack contains six Japanese 15mm mythological hounds in a mix of three different poses taken from SGF66, SGF67 and SGF68. This pack offers a small saving off single purchase of these codes. This pack contains six Japanese 15mm mythological felines in a mix of three different poses taken from SGF63, SGF64 and SGF65. This pack offers a small saving off single purchase of these codes. This pack contains six mixed 15mm Japanese mythic miniatures with at least one of each. These are taken from SGF75 Nekomata Kitten, SGF76 Inugami Pup, SGF77 Greater Centipede Demon, SGF78 Tsurube Otoshi and SGF79 Wanyudo. This pack offers a small saving off single purchase of these codes. 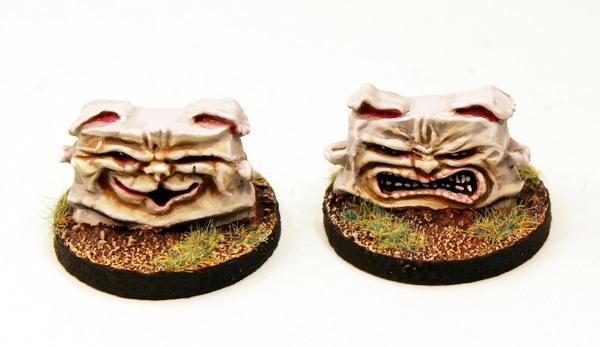 This pack contains six mixed from two poses of 15mm Japanese spirits that manifest as friendly or hostile walls; an even mix of both types. Taken from codes SGF80 and SGF81. This pack offers a small saving off single purchase of these codes. 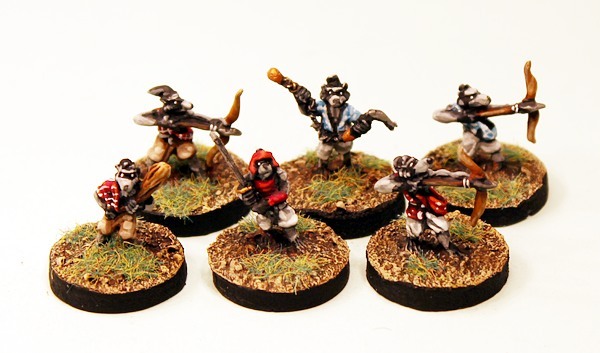 This pack contains twelve 15mm mythical raccoon warriors miniatures randomly taken from but including all of SGF70,71,72,73 and SGF74 plus the pack offers a small saving off single purchase of these codes. I just put in an order for a number if these. A lot of them will fit into my 28mm mythic Japanese forces too. It's a great range. The world needs more haunted futon miniatures. Thank you for your custom. That is good to hear, some of them are scale elastic for sure. It is a great range and indeed we also thought the world needed spooky sofas. Fantastic, got to be the most complete fantasy range anywhere- keep 'em coming! Thank you. John does great work and the next wave is underway design time now for a time later this season. 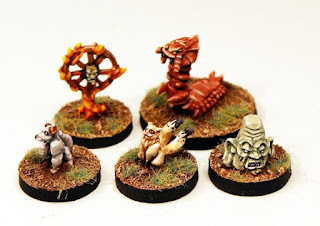 It is to my knowledge the biggest 15mm japanese mythic range anywhere with now 80 poses.